They may have lost a pet, a favourite study table or their story-books, and these are very dear and important to them. KOCHI: “The good news is that most people, despite going through a devastation like the recent floods in Kerala are highly resilient,” says Dr P J Saju, a Malayali psychiatrist based in Leeds, United Kingdom. He had come recently to Kochi to conduct a one-day workshop titled, ‘Overcoming trauma through courage and compassion - creating better worlds’ which was organised by the NGO Bodhini. The participants included psychologists, counsellors, psychiatrists and teachers who are working with the survivors. “They may appear helpless,” says Saju. “But it is very important that when you deal with them you should regard them not as a victim, but a survivor. Your task is to rekindle the strengths which have been affected by the trauma.”Interestingly, more than the men, it is the women and children who feel the stress more. “The women usually suffer from Post Traumatic Stress Disorder (PTSD) because they are dealing with the family all the time. It also depends on the extent of the damage. What has been the loss? If they have lost their livelihood, jobs, house and property, they are under more stress.”As for the children, most of the time, adults do not spare any time to listen to them. According to Saju, around 30 per cent of the affected people will have severe emotional problems that will prevent their return to normalcy. “Of that number, about 10 per cent may suffer from severe PTSD,” he says. “Some of them may feel suicidal. The remaining 20 per cent may suffer from depression. So they have to be helped with plenty of psycho-social assistance.”But Kerala has a few in-built advantages. “Our extensive family network can be very helpful,” says Saju. Saju says that going through a trauma does not necessarily inflict a lifelong psychological scar. “It might bring out the best in people,” he says. “They might become better human beings and value life more. Some might discover hidden strengths. For example, people may try a new business which might be successful. In Western psychology, this is called a post-traumatic growth.”Saju also told the participants that they could go through a difficult time even as they are helping the survivors. Saju grew up in Kochi. 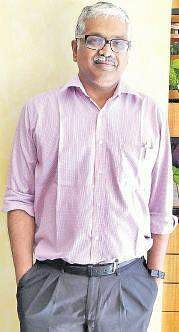 He did his graduation from Sacred Heart College, Thevara then completed his MBBS from Calicut Medical College in 1990. Thereafter, Saju went to CMC College in Vellore where he got his MD in psychiatric training and worked there for six years. In 1997 he went to the UK. Today, he runs a transgender clinic at Leeds city as well as a cognitive behavioural therapy clinic at a place called Wakefield. Interestingly, he says, over the years, Britain has changed a lot. Earlier, they were known for their stiff upper lip but now the people are more revealing of their emotions. “The change occurred when Princess Diana died in a car accident in 1997 and there was a public outpouring of grief,” says Saju. Also, multiculturalism is playing its role. As the Britons live with people from different cultures and ationalities, they are beginning to shed their reserve. Meanwhile, as he grows older, Saju feels the need to get back to his roots. “I come at least twice a year to see my mother who lives in Kochi and also to meet up with my friends and relatives,” he says.